Double your weight loss efforts with Force Factor LeanFire XT, a thermogenic fat-burner that oxidizes fat, increases endurance, and sharpens your concentration with clean energy and jitter-free focus. Don't settle for "just another fat burner." Get real results with LeanFire XT! LeanFire XT is engineered around a new concept, called "thermovigilance." This idea helped develop a fat-burning thermogenic complex, a blend of ingredients that help support heightened awareness, focus, and clarity without intense stimulant effects or jitters. Burning fat is equally mental and physical. LeanFire XT creates the ideal mental and physiological state for you to burn as much fat as possible. Taking LeanFire XT will give you the boost of energy you need to lose weight and get results. Read Force Factor LeanFire reviews and you'll see--many customers experience these energy-boosting results instantly! 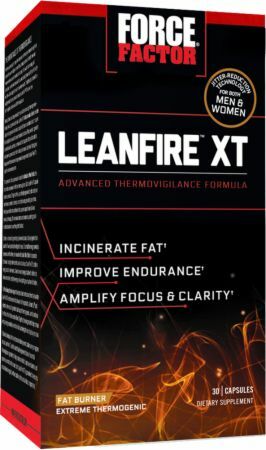 The fat-burning thermogenic complex found in LeanFire XT gives you the stamina and endurance you need to push your body while working out, with no unpleasant crash. It has natural fat burners that help suppress appetite and boost energy so you can experience real weight loss results. Can I Work Out While Taking LeanFire XT? LeanFire XT works if you work, and it works best when you work out, supporting a better mind-body connection so you can lift heavier and push harder, helping you build more muscle and burn fat. Unlike other fat burners, Force Factor LeanFire XT is a natural boost in energy without the unpleasant side effects. The supplement's proprietary jitter-reduction formula keeps you energized and focused without the negative effects of too much caffeine. What is Leanfire XT Made Of? Verilean: This green coffee bean extract component of has been clinically shown to help double your weight loss when used as directed. Green Tea Extract: Packed with catechins, green tea leaf extract is a powerful antioxidant, supporting natural fat-burning and recovery. Cayenne Pepper: By increasing body temperature, cayenne pepper adds to LeanFire XT's fat-burning thermogenic complex to help you lose weight naturally. BioPerine Black Pepper Fruit Extract: Helps enhance absorption of other ingredients in LeanFire XT's thermogenic complex for maximum fat-burning efficiency. Caffeine Anhydrous: Force Factor LeanFire XT contains 150 milligrams of caffeine--enough caffeine to stimulate concentration and energy, but not enough to make you feel jittery. Yohimbine HCl: Yohimbine bark is an energy-boosting ingredient to help enhance athletic performance and weight loss. TeaCrine: A premium ingredient naturally found in certain tea leaves, coffee, and exotic fruit, TeaCrine helps promote optimal energy and performance. DMAE: DMAE supports the mind-muscle connection and key metabolic processes to support better strength performance and healthier BMI. L-Carnitine: L-Carnitine is an amino acid that helps reduce metabolic waste during exercise to promote better, cleaner fat-burning in the body. L-Theanine: A natural amino acid found in tea leaves, L-Theanine helps give you energy and focus as LeanFire XT works to accelerate fat oxidation. How Much LeanFire XT Should You Take? For enhanced fat-burning, take one LeanFire XT fat burner pill twice a day, half an hour to an hour before meals. Avoid taking it at night as it may disrupt your sleep. Read below for more Force Factor LeanFire XT reviews to help determine if LeanFire XT is right for you. I'm not a BB, nor am I an athlete - I only enjoy running with my music pumping in my ears and some body exercises (ShawnT is too much to handle though - makes me E A T a wagon of kcals). This stuff makes my body "anxious" kind of energetic or "disturbing" and makes me stop craving food. It works the best on an empty stomach. I have tried Saffron supplements before that claim to numb your appetite, but LeanFire XT is the best of them all (for me). And yes, I've bought these on eBay and noticed they are a different color - solid red. Have yet to test out and see whether this kind is any different from the dual-color ones. When I first started taking this I had great results instantly - lost several pounds in just a few days. However results quickly tapered off and by the 2nd week this was doing nothing. Please do not get this garbage. It did absolutely nothing for me. I'm 222 pounds, 6 foot 4. In my time using it as directed, maybe lost 2 pounds. It's not worth your money. Use a product with better reviews. This is a good example of false advertising. I'm beginning to see a change, not sure if it is completely due to this supplement. However, I received and used the trial offer and then just ordered a new shipment and noticed the pill capsules are red and white instead of solid red coloring. Did the capsule color change that quickly? I've been taking LeanFire XT mostly on days which I'm working out in the mid-afternoon because it gives me the energy I need when I usually hit the gym at 5:30 PM. I'm a fan of Force Factor and I take Test X180 Ignite each morning. LeanFire XT is solid for anyone looking to increase their chances of losing weight. I've been on a cardio kick recently and I look at LeanFire XT as an accelerator to burn fat. I wouldn't take this product in the evenings because I'm sensitive to caffeine so I always make sure to take it in the early afternoon so I'm able to keep up my momentum to finish up the work day and be able to go hard in the gym right after work. Today is only day 1 but the energy I felt reminded me of the original OxyElite pro. My appetite was only slightly suppressed but it still seemed to work. I am excited to see where this supplement gets me with my fitness goals. I will update my review in 1 week from now. MY fingers are crossed that finally I found something that works for me. It's been 1 week today and I'm loving this supplement. I will be purchasing the bigger bottle. Gelatin, Dicalcium Phosphate, Magnesium Stearate, Titanium Dioxide, FD&C Red #40, FD&C Blue #1. Directions For LeanFire XT: Take 1 capsule twice daily, 30 to 60 minutes before your two biggest meals. Do not take within 4 hours of bedtime. Warnings: Keep out of reach of children. For adult use only. Use only as directed. Consult a healthcare professional before use if you are pregnant or nursing, have a medical condition, or use prescription medications. Store in a cool, dry place. Protect from heat, light, and moisture. The recommended dose of this product contains about as much caffeine as one and a half cups of coffee. Limit the use of caffeine-containing medications, foods, and beverages while taking this product, because too much caffeine may cause nervousness, irritability, sleeplessness, and, occasionally, rapid heartbeat. Do not consume alcohol, drive, or operate heavy machinery while taking this product.